Someone asked recently about what I’m using for majolica decorating, now that the AMACO GDC colors are discontinued. 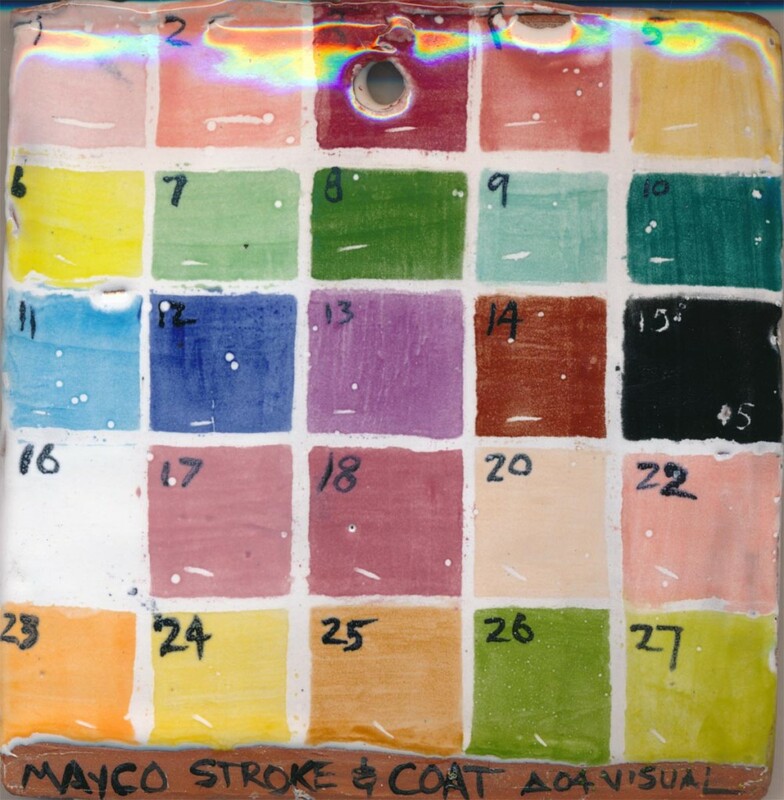 Thanks to Susan Hunter at C & R Ceramics in Ocala, FL, I was able to test Mayco Stroke & Coat colors on top of my majolica base, fired to cone 03 sitter cone/ small 04 cone visual at about 200 degrees/hour. See the Mayco link for their product information. The colors were originally intended as cone 06 glazes, and can be used to decorate on top of a viscous white glaze for majolica inglaze decoration. The series offers a huge number of color shades, and whoever named them had a good time making up fun color names. The work well, and have been successful for making smooth ground color – they brush smoothly, and don’t move when fired. They are, however, like putting a glaze on top of the majolica glaze, and any texture in the base glaze tends to pick up. There are some light distortions at the top of the images below as I just popped the tiles down on my scanner to try getting an image. Setting up my photo lights and screens would have made better images, but would not have happened as soon. The commercial colors are uniform, brush easily, and are repeatable. In spite of that, I am liking my return to mixing my own colors. The gum component in commercial colors, if over-done, can make the colors gloppy for brushing fine lines. Manufacturers may change colors or formulas without notice. The use of a color that is glaze-like over the majolica makes a more translucent color for some colors. Whether this is an asset or a liability is a matter of personal aesthetic. I have previously posted information about Spectrum’s product, which seemed better suited to 06 firing than my 03 sitter cone firing, and A.R.T.’s Glazewerks Maiolica colors, which worked well at my temperature and with my glaze. If you’re looking for my glaze recipe, see the Majolica and Lowfire handout on my website handouts page. I’m preferring the control, flow, and look of mixing my own colors, and have bought some low, wide-mouthed jars for my colors (so I don’t knock them over on my table). Details on what to mix below. Bentonite bloats in water (like adding cocoa or cinnamon to liquids) and will lump up unless mixed with the dry ingredients first (like mixing your cocoa with sugar first). I stir dry (don’t breathe the dust! ), add water, and mix with a small wisk. I generally then screen in a small test sieve. Talisman and Euclid’s offer such screens. I’m using an 80 mesh, and push the mix through with a mini silicone spatula. Most of what I’m using are stains, mixed with frit 3124 and bentonite by volume (e.g. by teaspoon) at a proportion of 1 color + 1 bentonite + 3-4 frit. I tried using less bentonite – 1/2 – , thinking less clay would give me a cleaner fine line with black, but it tended to smear when waxed over. I’ve gone back to using equal amounts stain and bentonite. Most stains are good with 3 parts frit to help melt them into the glaze surface. There are exceptions, though. Many of the blue stains are refractory (resistant to melting) and need 4 parts frit to help them melt in. the mineral rutile (orange-brown fired color) and chrome oxide (opaque grass green color) work well as colorants, but are also refractory and need 4 parts frit. Copper carbonate, cobalt carbonate, manganese dioxide, and iron melt at lowfire temperatures, and would be mixed at 1:1:1 proportions. I do use copper to modify some green and blue colors. Putting it on very heavily will cause a silvery surface that will probably leach with acid foods. If you get that result, you’re using it too heavily for food use. Cobalt carbonate works well, but is pale lavender-grey raw. This makes if hard to remember what is where while working, and hard to visualize what may be a navy blue result. This could be avoided by putting blue food color in your cobalt-frit-bentonite mix. Since iron is just brown and manganese is brownish, I rarely use them for majolica, although they can work. Manganese gives off toxic fumes in firing. As a decorating color for majolica, this would be a small amount, but still toxic. Stains designated as body stains (for coloring clay bodies at all temperatures) are too refractory for majolica use, and even when mixed with flux give a matte pig-skinned (wrinkled) surface on top of most majolica glazes. Some of those stains: Mason 6020 Manganese-alumina pink, 6485 Titanium yellow, 6319 Lavender. 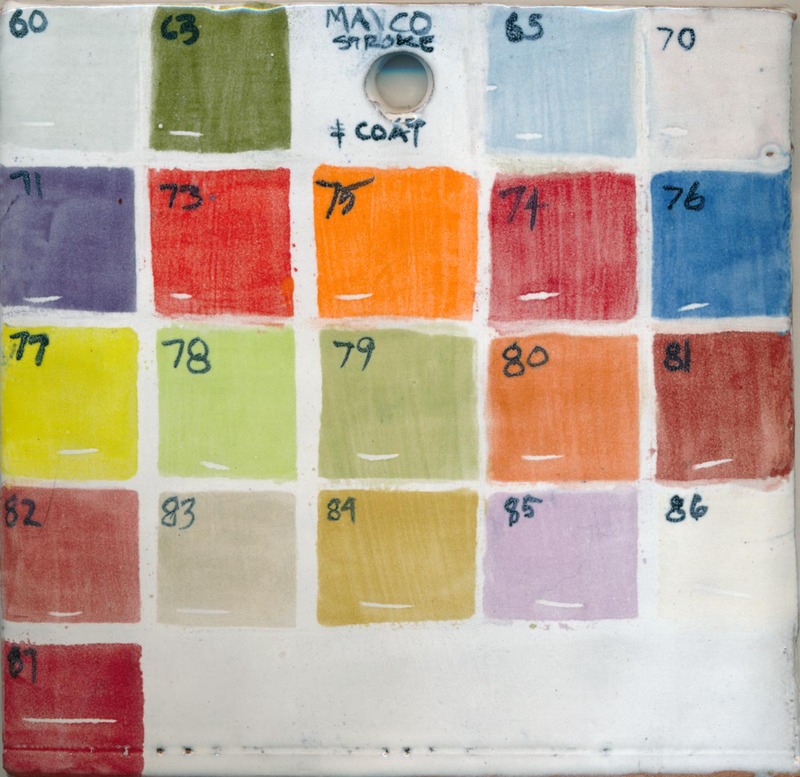 For those who remember the original AMACO GDC Light Red color, which was a lovely red-orange toward persimmon, Mason Lobster stain is that color and can be mixed as above. This entry was posted in Ceramic tech info, Majolica and tagged majolica by arbuck. Bookmark the permalink. Hi Linda. I work in a mid-fire studio and want to adapt a majolica style. Can I use amaco’s velvet over a stable white or satin clear glaze to cone 5/6 ? This is just a look i want to create.and need to stay with the Studios parameters. Thanks. Nancy N.
Yes, you can test the Velvets. When I last tested them (some time ago!) they had a wide degree of fluxing at 03 – from completely usable to majolica to so refractory they pig-skinned (so resistant to melting they were matt and wrinkled up the surface). So, test. Same with other similar products from other brands. Mayco Stroke N Coats all seem to be similarly fluxed and melting about the same and usable. The Standard Glazewerks (formerly an A.R.T. Studios product) all flux the same and work at 03, and would probably be o.k. at 6. You can also try mixing your own. Follow the instructions on my website handouts page from Majolica and Lowfire, and either reduce the amount of frit used in the decorating colors, or test Neph Sy as a flux. There is a c6 majolica glaze on the handout that I’ve used. I found your blog while looking for information on Stroke-n-Coat, but wanted to thank you for ALL of the knowledge you’ve shared. The .pdf’s on firing are great. I just got my first (tiny) kiln, and have a lot to learn. I did go to UF, but clearly chose the wrong major. Business school was not nearly as fun. Thanks for a second chance at it! Hi! 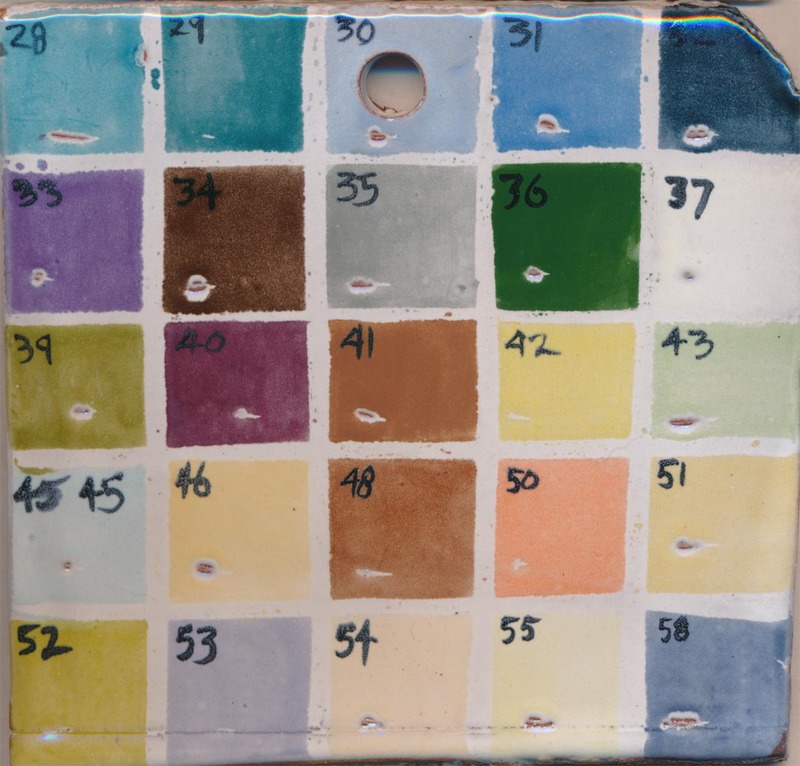 I have been searching everywhere for the color glaze you have created labeled #85 on the test tile (lavender pinkish color)! It would mean the world to me if you were to share the name of that color and how you were able to get it! I am working with cone 6 porcelain:) thank you so much! Hi Linda, I attended your majolica workshop at Amaco in Indianapolis when you were using their GDC’s. I teach HS ceramics and my students had been making beautiful majolica platters using traditional Italian repeat patterns, for years. I was surprised and disappointed when Amaco discontinued the glazes. I have heard using underglazes over their LG11 white base glaze may work but after reading this article about using stroke n coat, I was wondering if you recommend this rather than the UG’s. Any tips or suggestions you can offer would be greatly appreciated. Hello Chris. Traditional underglazes are clay, colorants, some flux, and binders (like gums for brushability) – like a finely ground slip – high in clay content and colored. The Velvets or One-Strokes are more fluxed than usual underglazes. When I tested AMACO Velvets some years ago, the amount of melt at 03 varied greatly. Some colors worked just fine and fluxed into a smooth, glossy surface on majolica, some were refractory and had a dull, matte surface, like putting clay on top of glaze, and few were so refractory they pig-skinned (wrinkled, matte surface). So, you have to test to see if they’re melting well on top of your majolica glaze. I don’t know if AMACO has changed for formula on the Velvets since I tested. The majolica decorating colors are generally less clay – just flux, colorants, and maybe a bit of bentonite, with the commercial colors also having some gum. I have a recipe to mix your own decorating colors with oxides or stains in the majolica handout on my web site. It’s by volume and pretty simple – I mix it up by teaspoons, but for a class you could mix by measuring cup. I have an immersion blender for studio that I use to mix, and if the bentonite is lumpy, I will screen it through a test sieve. Mixing the bentonite w/the dry ingredients first helps (like in baking mixing powdered cocoa with sugar first before adding liquids.) The Stroke n Coats all work on majolica at 03, as do the A.R.T. Studios Glazewerks Maiolica colors. Best on adjusting to the new substitutes. Once I got past the resistance to change, I find I like the colors I mix myself well. The commercial colors seem to be more like transparent glaze on top of majolica, and are sometimes over-gummed so it’s hard to make a sharp, crisp line or put down an even coat for solid areas. I don’t use gum in mine, just frit 3124, color, and bentonite to the amounts by volume in the handout.